Posted by elizabethwong in Event, History, Human Rights, International, Southeast Asia. Posted by elizabethwong in "We can do better", Current Affairs, Democracy, Huh? !, Human Rights, International, Malaysia, Note2Self, Politics, Southeast Asia. This is a most telling statement to date. In the past, at least the government puts up a facade and employs politically-correct language to soothe one’s apprehension over the state of democracy and the independence of the judiciary. Today, it has been affirmed that the three fundamental pillars of a democratic society – the Executive, the Legislative and the Judiciary – are not independent. 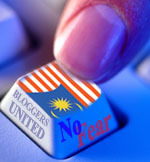 Today’s statement, as reported by Malaysiakini, by Minister in the Prime Minister’s Department should shock everyone. On why Ahmad Fairuz (the Chief Justice) has been evading the media, Nazri said it was because the former is not answerable to the press. I’m going through all the politically sensitive cases now, the most glaring being the trial of former deputy Prime Minister Anwar Ibrahim in 1998-99, condemn by all and sundry as a ‘kangaroo’ trial. We find that even back in 1789 after the French Revolution, the French Declaration of the Rights of Man and Citizen had this concept:- “Any society in which rights are not guaranteed, or in which the separation of powers is not defined, has no constitution.” (Article 16). “Power tends to corrupt, and absolute power corrupts absolutely. Great men are almost always bad men.” (3 April 1887 in an letter to the Bishop of London, Mandell Creighton). Then about another century forward in 1988, Malaysia saw the complete dismantling of the independence of the judiciary. The Chief Justice is answerable to the Minister in the Prime Minister’s Department = Prime Minister. Posted by elizabethwong in "We can do better", Current Affairs, Democracy, Human Rights, Malaysia, Note2Self, Politics, Southeast Asia. Whatever the talk may be, I think this latest video revelation is a fitting farewell for Ahmad Fairuz. He has surpassed all the previous Chief Justices and brought the bar so low on all attributes required of a Chief Justice of Malaysia that only Mother Nature’s most useless and vile creatures would have the necessary (not required) attributes to assume the position. Amer Hamzah Arshad, lawyer, in “Time for Action, By Any Means Necessary”, Malaysian Bar website. Let us not have the ‘what if’ thought when we are on our deathbeds, wondering if there was something else that we could have done other than merely attending the EGM and issue statement/comments. If blood has to be shed, let it be for the cause of upholding the integrity of the judiciary. If heads have to roll, let them be the heads of the culprits that have brought eternal shame to our judiciary. “Poison pen letter against Ahmad Fairuz surfaces“, Malaysiakini. In their joint statement, they (former Transparency International Malaysia presidents Param Cumaraswamy and Tunku Abdul Aziz Ibrahim) urge Prime Minister Abdullah Ahmad Badawi to invoke Article 125 of the federal constitution to set up a tribunal for the removal of Ahmad Fairuz as judge.